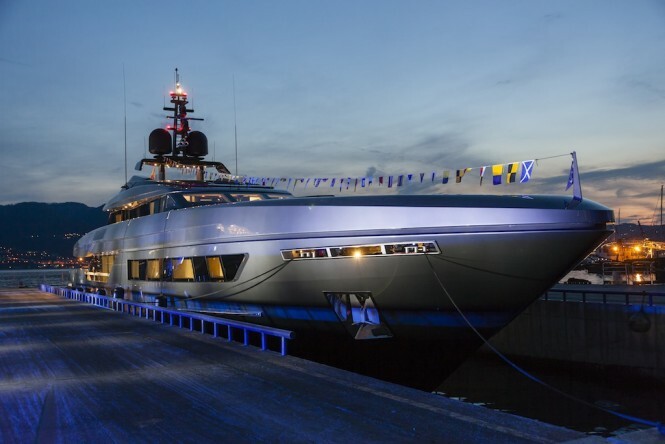 The Baglietto 46m superyacht has been launched, marking the birth of the Italian yard’s Fast line.The aluminium planing yacht has been designed inside and out by Francesco Paszkowski Design. It has a dynamic profile, with a receding bow and strong stern, which typify the builder’s style. But trapezoidal ports, alternated with rectangular windows at two different levels, give the 46m Fast a more contemporary exterior look. The superyacht has been launched, marking the birth of the Italian yard’s Fast line.The aluminium planing yacht has been designed inside and out by Francesco Paszkowski Design. It has a dynamic profile, with a receding bow and strong stern, which typify the builder’s style. But trapezoidal ports, alternated with rectangular windows at two different levels, give the 46m Fast a more contemporary exterior look. The outdoor areas of the 46m Fast have been maximised to give the feeling of being close to the sea whilst cruising or at anchor. The bow features a swimming pool and conversation area covered by a bimini. The teak main deck aft accommodates a large table and a sunbathing area. Interiors include four lower deck guest cabins and an owner’s suite with a wellness area, office and dressing room located on the main deck. The upper deck, which has been designed like an open terrace, includes the sky lounge with conversation area, captain’s cabin and the wheelhouse. The four crew cabins, galley and crew mess are on the lower deck.